On Sale Now for $19.95: Surprise her with a personalized frame filled with a beloved family photo. She’ll cherish it always. See it now. Save 15% plus free shipping. This is your chance to save on this classic design, which includes a choice of lettering style and ink color. Ships in 24 hours. Save 15%. Fill your home with the names of those whom you cherish. It’s easy with these beautifully crafted wall signs. See the collection now. It’s the special details, like personalized napkins and guest towels, that make a party an “event.” These designs will get everyone talking. Save 15%. 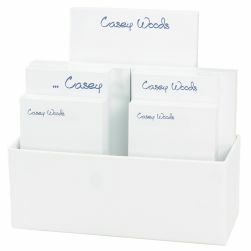 More than just a notepad, these personalized papers convey style and taste. They’re like jewelry for your desk, purse or counter. Shop now. Save 15%. Sometimes it’s those little extras that tie a room together and make it a destination. Create barware, coasters, napkins and other party accessories. I have bought just about every kind of product Giftsin24 has to offer. Recently I ordered a card from their family pride collection and I was blown away. The time and effort they put into each item is mind boggling. I don't know how they do it. But it's not just the quality of their products that separates them from other companies - it is also the prompt service they offer. Keeping track of holidays and birthday parties can be tricky, but it’s nice to know that a company that strives on delivering the best service possible is just a click away. Fast Delivery: Order today, we'll ship it tomorrow, for most orders. Free Shipping: Enjoy our free FedEx Ground Shipping option. 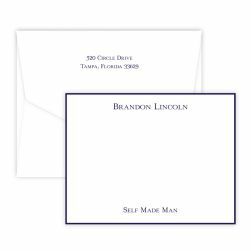 The Most Monograms: We offer dozens of monogram styles on hundreds of products, including stationery, party napkins, notepads and engraved gifts. Choose Your Lettering Styles: Personalization is our thing. That's why we offer you the most choices in unique lettering styles that express the true you. Our Gold Leaf Gift Box: A little taste of luxury! We carefully wrap each order with tissue paper, affix it with a seal, and nestle it in an elegant foil box. Your personalized stationery is just a day away with Giftsin24! Tell us your ideas for notecards or paper, and we can have custom stationery sets shipped to you within 24 hours of your order. As the nation's top producer of social stationery, our company is here to help you find a design that's perfect for you. We make every order in-house at our state-of-the-art facility in Aurora, Illinois; pride ourselves on order accuracy; and beautifully package all our goods. Browse our site to learn more about our 10 designer lettering styles, the sophistication of raised ink, and all the various color schemes you can choose from in your custom stationery. Whether you want an elegant monogram or your full name in creative lettering, you're sure to love the results. 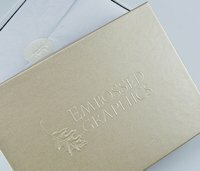 Giftsin24 specializes in fine personalized stationery, notepads, party napkins and other custom engraved gifts - all designed to celebrate your unique style. 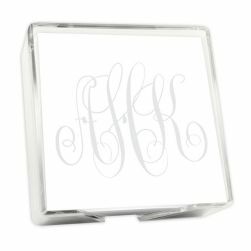 Showcase your monogram on an engraved cutting board or elegant notecards. Get custom party napkins for a special event - whether it's a wedding, birthday party or golden anniversary. From personalized glass and cork coasters to notepads bearing your name, we design all our products to suit you. In today's digital age, there's nothing like a handwritten note to show someone you care - especially when that note is written on paper displaying your name. Giftsin24 offers dozens of monogram styles and unique lettering options. Choose from lovely elements such as crisp embossing, rich raised ink, colorful borders and artful monograms. We carry a range of papers - from single-thick to fine cotton - and all our notecards come with color-matched envelopes. Expect your experience with our business to be a little taste of luxury. Even our packaging reflects our commitment to excellence. Every order comes in a champagne foil gift box, where it's wrapped with tissue paper and affixed with a seal. Backed by more than a half-century in the printing business, Giftsin24 is a family-owned company offering high quality, low prices and fast turnaround on custom stationery. Place your order today, and we'll ship it tomorrow, in most cases! As one of the few highly specialized national printing companies in this industry, we're proud to stand out in the marketplace as the top producer of social stationery in the United States. Our orders travel via free FedEx ground shipping and arrive ready to take your breath away. Ready to learn more about personalized notes from Giftsin24? Shop the possibilities on our site and place your order today!